“I found it very eye-opening. Trained and certified together in DISC by Personality Insights, Catherine and Christine are both Certified Human Behavior Consultants. And moms. So they get where you are and understand your struggles. Using the insights they have learned as corporate trainers, Catherine and Christine have created a workshop designed specifically for parents. Talking to your teenager (or preteen!) can be especially challenging. From tween to twenty our parenting styles need to adapt. You may will feel out of your comfort zone trying to navigate these critical years. In this workshop you will receive concrete information that will allow you to reduce stress in your home and help you foster the kind of communication you are craving with your kid. 3 hour in-depth, interactive small-group workshop with Accredited Trainers. Enrollment fee is per attendee – only adults/parent(s) attend. All workshop materials including reference materials and at-home exercises. ‘4 Lessons for Better Relationships’ and our ‘Fun Book’ workbooks. Practical applications, real life examples and strategies. Assessments are priced separately for added flexibility. Choose just yourself and one child or have your whole family take the online assessment at home prior to the workshop. Concise Personality Profiles are $30 each and in-depth Extended Reports are available for $75 each. Assessment instructions are emailed about one week prior to the workshop and take approximately 20 minutes to complete. Each person’s unique personality is full of positive attributes. Being able to uncover the needs and motivations of these attributes is life changing. Using the DISC Assessment and relationship mapping you will gain insights into the way your teen is wired and how to work with them where they are – as who they are – without trying to change them. You will, however, be able to change the outcome of your interactions by practicing the techniques covered in the Empowered Parenting/Talking to Teens workshops. You will also gain greater understanding of yourself and your own needs and tendencies that may be blindspots in your self-awareness and impacting your parenting. These tools have enabled Catherine and Christine to better appreciate the innate personalities of their own children and it’s our sincere hope they will do the same for you. Christine Horstman is an Accredited Trainer with Personality Insights and the owner of Paper Doll Communication, a boutique consulting and coaching company. She loves assisting both people and organizations reach their full potential. Christine is passionate about education and lifelong learning, and is an advocate for the needs of Learning Different students. She is the mom to a teenage son with Dyslexia, ADHD (Inattentive type), and Sensory Processing differences. Her quest for support and relentless research on behalf of her son has increased her understanding of the way people learn and process information. She believes the DISC personality profile is an amazing tool for greater self-understanding and offers parents invaluable insights into how to bring out the best in their children and deepen their understanding of one another. Catherine Walker comes to you with over 19 years experience as an Executive Leader training and mentoring 100’s of team members. While working with her teams, she realized you can not coach every person the same way. You have to adjust to their individual personality styles. The same is true with parenting. Kids come out with their own hard wiring. Catherine’s three girls ages 15, 19, and 22 are all very different in personality. As a mom, she has had to adjust her manner of speaking and approach to each of her girls in order to communicate effectively. There is not a “one and done” method to parenting. With no manual to guide you, parenting can be difficult especially through the preteen and teen years. Catherine is a credible speaker and trainer who wants to equip more moms and dads with the know-how to connect with their kids on a deeper level. You will find her training full of tangible ideas that you can implement right away! 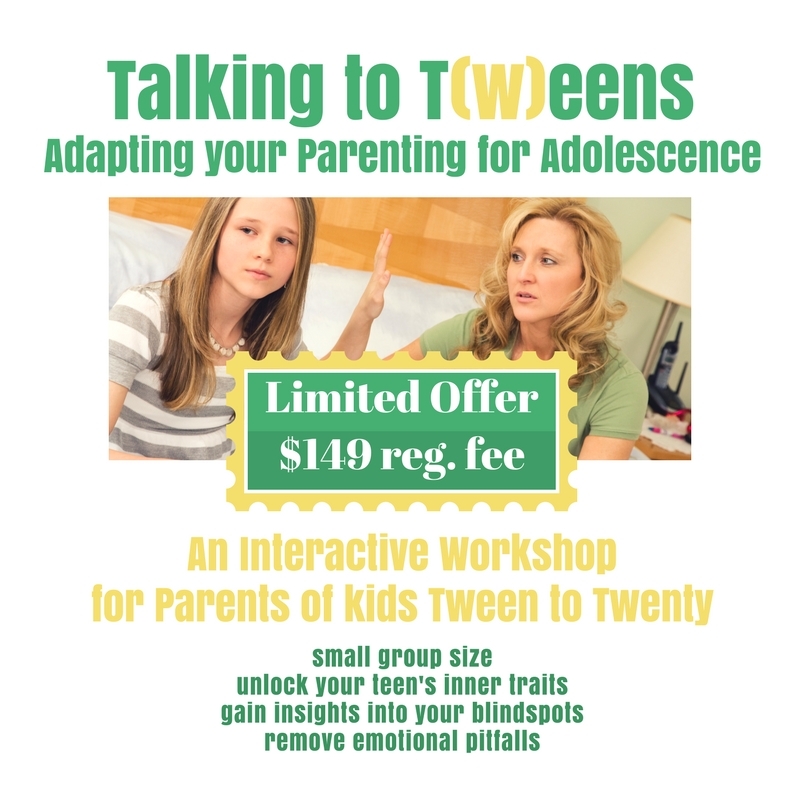 Attending this workshop can help unlock the door to understanding yourself and your kid(s).